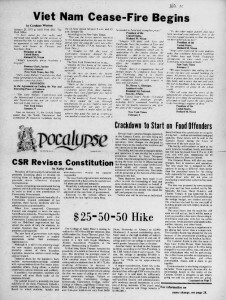 This front page, from Feb. 1973, reflects the more activist leaning of Saint Rose students than the student journalism practiced in 1952. 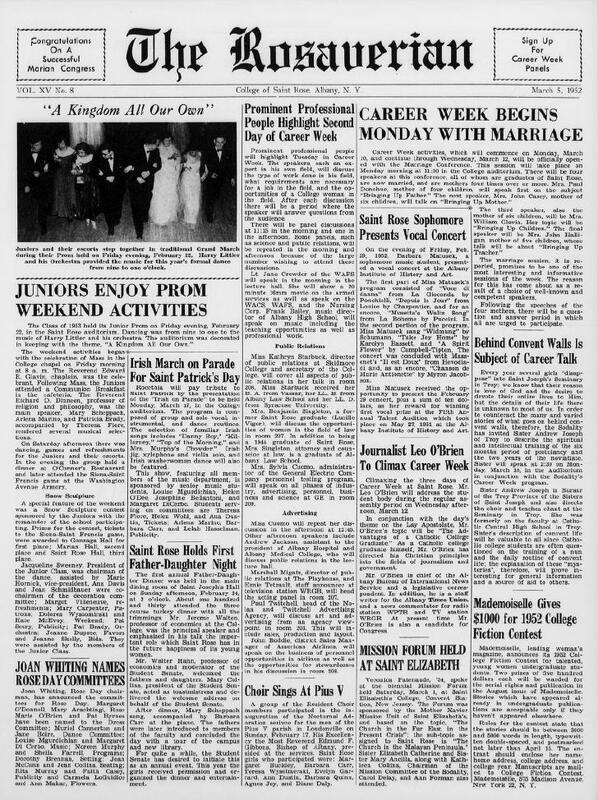 Now available: Fifty years of Saint Rose’s past, electronic and easily searchable. The College archives, housed in the Neil Hellman Library, has just digitized Saint Rose student newspapers and magazines from 1921 to 1970. Exhibiting a variety of titles and journalistic styles, the materials join a digital collection of oral histories, photographs and maps that piece together the story of this once-tiny women’s college housed in a single building. “You get to see what 18 -to 21- year olds are like in all different eras,” said college archivist Maria Kessler McShane, who should know since she oversaw the conversion of 403 newspapers and 40 student magazines. The digital archive is available at: http://library.strose.edu/archivesdigitalcollections. Users can now search for a topic, say “World War II,” rather than go through boxes of publications in the third-floor archives. Saint Rose publications also join WorldCat.org, the online catalogue of virtually all materials all libraries own. “Original materials that aren’t handled as much can be properly stored and preserved,” McShane said. There was also The Gadfly, The Chronicle, Saint Rose Chronicle and, once again today, just “Chronicle.” The early newspapers are devoted to religious topics, including descriptions of Catholic services and news from the Diocese. A formal, nearly courtly style informs the writing as reports on campus events – including pageants, glee club performances and summer travels – gradually give way to news about the College and beyond. 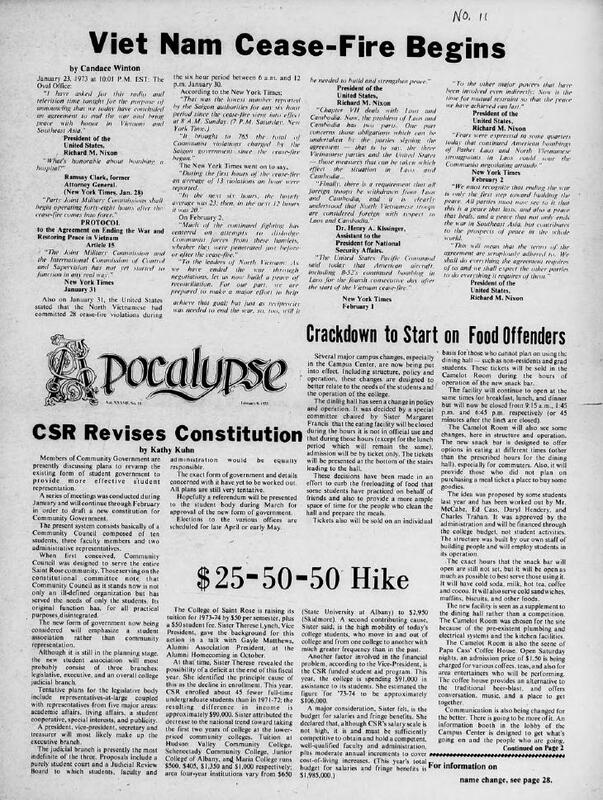 The writing grows decidedly starker by the 1970s as student journalists use the pages as a call for action, on and off campus, including a demand that President Nixon end the Vietnam War. The evolution of college, and country through the century will become more apparent when McShane completes the job and posts titles for the past 40 years. From 1952's The Rosaverian, as it was known, concerned itself with somewhat mellower issues. History-bound items have been set aside since the College’s founding, though the archive itself wasn’t established until 1990. Materials come largely from the college departments and alumni. And McShane has feelers out much of the time, seeking copies of programs and other keepsakes that might not be considered especially historic at the moment. She acknowledges that posting records on the Internet stands to limit actual physical visits to an archives. But McShane believes digital access actually builds interest in history since users can so easily obtain information they are excited about. She also cautions anyone who stores photos and documents on their computers and smart phones not to assume they will last forever. McShane finds students are often surprised to learn Facebook is not permanent.